The last two days I have been careful. I've not done anything that will involve sitting upright for too long. I've not gone out. I've not seen anyone except my OH and I've definitely NOT done any sewing. Normally this would really make me grumpy but I am doing this for a reason. It is not because I have hurt myself more than usual, it is because I am trying to avoid hurting myself so I can go to see some live music tonight. I very rarely get to go out with just my OH. We usually only go out on either pre-arranged big occasions such as a friend's birthday or a family wedding. It's either that or a completely spontaneous "let's go out for a pub lunch because I'm not in agony" type of affair. But this time we have bought tickets to go and see Polar Bear. I have been to only one other live music event at this venue, and that was also in a Cabaret Style set up. I love that you can sit at a table with a drink and watch live music, even if it is only a soft drink because of my meds. We are taking the wheelchair so I can sit in slightly more comfort than is afforded by fold up seats. I'm really excited, even if I am slightly disappointed that I haven't been able to do any sewing. However, no sewing means more knitting. I've been working on my Leaves of Grass Shawl. Yes, doesn't it look lovely! 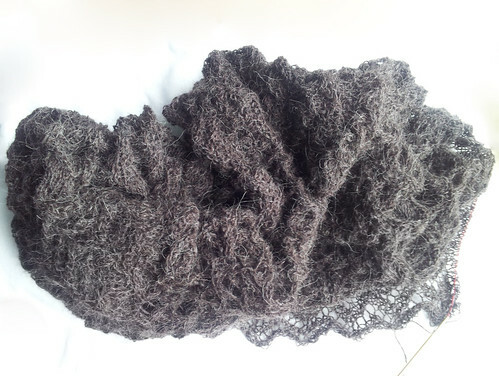 It's so easy to forget that when you are knitting a shawl, it is often an act of blind faith it will turn out ok. It resembles nothing more attractive than a woolly blob. I am in the throes of setting the woolly beast free from it's constraints. I am finally at the knitted on border stage. 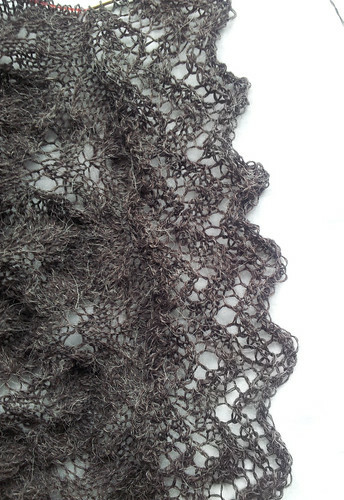 As I complete each repeat of the 16 row chart, more and more of the shawl is liberated. I cannot wait to see how this turns out when it is finally off the needles and on the blocking board. In other news, I have been online shopping this week. 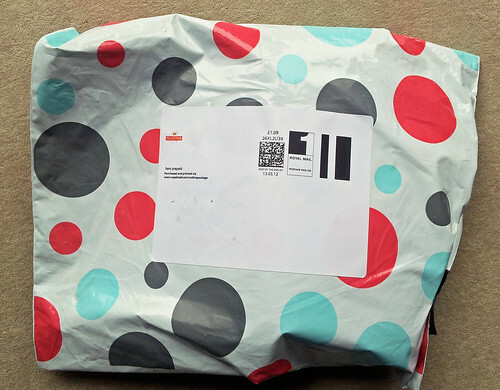 Susan of Canadian Abroad blogged about a new UK shop and a giveaway they were having. The shop is The Village Haberdashery. Susan is a very bad person for posting links to this yummy new shop. Of course when went to have a look at it, I ended up buying nice things. I only ordered my purchases on Monday afternoon and look at what came in the post this morning. Isn't that the nicest plastic wrapping you've ever seen? It's so cheerful compared to the normal grey. Inside the pretty exterior were some Addi Turbo needles that I ordered. I'm trying to build up my supply of this particular brand of circular needle as I have found them really nice for using with laceweight or delicate yarns. The join between needle and cable is so smooth compared to my KnitPro Options. It's nice to see another UK supplier of Addi needles and I thought it would be a good way to test out the service of a new online retailer. While I was shopping for needles a skein of yarn accidentally jumped into my basket. Isn't it pretty? It is my favourite shade of purple. When I saw it, I had to have it. It is perfect for an idea I have floating round my head at the moment for a shawl. 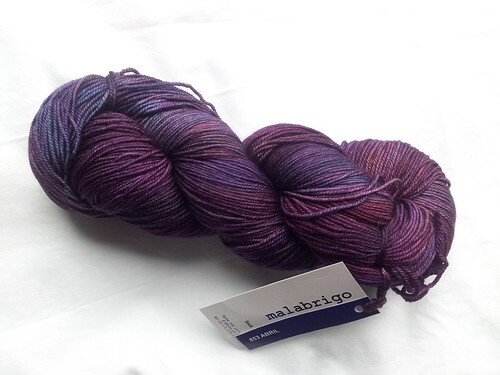 One of the main problems of shopping for anything whilst in the midst of the dreaming stages of design, is when you see a lovely yarn, you justify it's purchase by knowing it is perfect for your new design. It is perfect, I promise..... it's just it might take a while to become that design! Anyway, I thought I would share the details of the new shop and tell you that the service was great and you should have a look. It has both yummy yarns and fabulous fabrics. A lethal combination in my case. This did actually start out as a WIP post, so if you want to hear about other people's projects rather than my social and shopping antics, click on the button!